A faster more effective way to boost vitamin B12 levels! The UK’s first ever daily vitamin B12 oral spray has hit the health supplement market, offering fast relief to thousands of fatigued people. 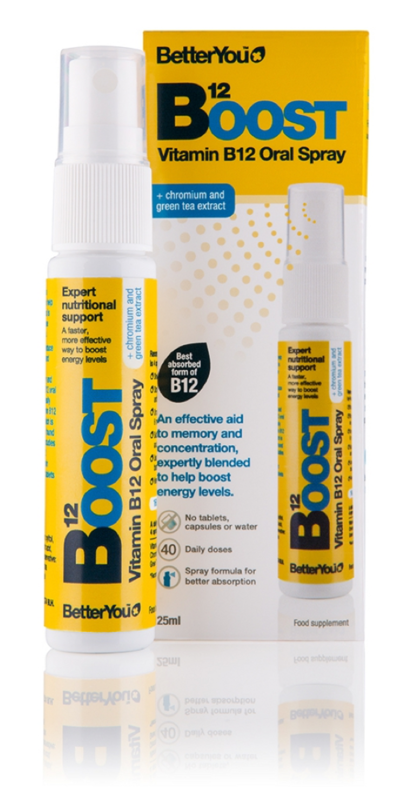 Developed by innovative UK healthcare company BetterYou, B12 - Boost contains vitamin B12, chromium and green tea extract, all associated with energy production and body metabolism, providing an effective source of natural energy in the form of a daily oral spray. By obtaining B12 under the tongue, the vitamin is absorbed directly into the bloodstream, avoiding the digestive system which can destroy essential nutrients with strong enzymes and acids. In fact, B12 is so difficult to absorb that only one per cent of intake from food is actually retained. Vitamin B12 is specifically known for its role in producing healthy amounts of red blood cells which are necessary for the proper delivery of the required oxygen to the body's cells and tissues. Research has also found that B vitamins are linked to cognitive health and memory, and in particular maintaining the body’s energy levels. Foods which commonly contain B vitamins include red meats, fish and dairy products, but today’s modern lifestyles often mean that digestive problems or illness can dramatically reduce the absorption of key daily vitamins. At risk groups for vitamin B12 deficiency are vegetarians and vegans, the over 50s, athletes and pregnant and lactating women. Deficiency occurs when the body fails to absorb enough of the vitamin for many different reasons, including anaemia, Chrone’s disease, a reduction in stomach acid, or lifestyle choices. B12 Boost is suitable for vegetarian, vegans and throughout pregnancy and breastfeeding. It delivers 160 sprays, designed to last 40 days.